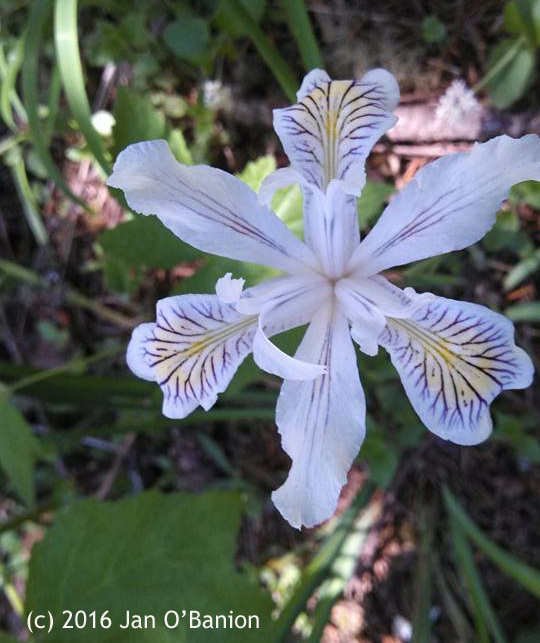 Amazing metal jewelry artist and good friend, Jan O’Banion of Jan E O Jewelry, dabbles in photography and shot this beautiful photo of a wild iris she spotted while on a hike outside Lowell, OR. And what a pretty iris it is. I love its shapes, texture and delicateness. the simple soft base colors (white/yellow) with the bold purple veins turn it into a work of art. The round yellow sections on the three wider petals, look like little sun mandalas warming up the flower and radiating joyfulness throughout the land. I believe the desire to adorn is what makes us human. I am a self taught jewelry artists and as long as I can remember I have been putting objects together to create adornment. Sometimes I wish I had more arms like those statues from India so I would wear more bracelets. The planet is important to me so I am moving away from gemstones and materials that are mined in other countries and am using more recycled, repurposed and scrap materials. Thrift stores are one of my favorite places to forage. You can view her spectacular jewelry via her online store. …the most famous royal use of the iris as a symbol of power and position was that of the Bourbon Kings of France, including Louis XIV. The iris was adapted on royal banners as the “Fleur de Lys”, the elegant, three-sectioned symbol that disappeared from the French flag with their Revolution, but is still quite common in the decorative arts. In fact, today it still proudly adorns the beautiful flag of the French-founded Province of Quebec in Canada. Since Jan’s Wild Iris uses purple, yellow and white, it inspires us to be wise in our actions, motivated by passion, and founded on the purest of intentions.